I’ve been traveling and have fallen a bit behind in posting my columns. Below is my article published a couple of weeks ago, and published online March 27, 2012. I’m starting to think a lot about the intersection of religion and politics, so there should be more on this topic soon. There is a certain structure religion gives to our lives. At the birth of a child or death of a loved one, we turn to some sort of faith more often than not. When oaths are sworn in courts of law, it is a holy book on which we swear to remain truthful. And when politicians promise to abide by the earthly laws we create, they raise a hand and address a god somewhere. Faith shapes our lives, but not our governments – at least not directly, and not on paper. Laws uphold and protect only the legal separation of church and state in most countries. This formality can trick us into thinking that religion keeps its distance from politics. But the truth is that the two have never really been separated. There are prayer breakfasts, the invocation of god’s name in such places as national anthems and currencies, and prayers at the start of government meetings and functions. Heaven forbid a U.S. president should end a national address without the words, “God bless America”. Although these are benign examples of the blending of church and state, the clashes can be much more fierce when religion comes head to head with public policy. In the United States, there are vicious, and even deadly, battles over abortion laws and the teaching of evolution, as opposed to the more biblical creationism, in schools. In France, veils that cover the face (such as the hijab or burka) are banned in public places. In a number of African countries, including Uganda, marriage laws have been unsuccessful at prohibiting polygamy because such a ban is seen to violate religious practices. These are perhaps some of the most blatant and controversial clashes between faith and the state, but the religious beliefs of political leaders can also sneak into their public policy in less obvious ways. The support of evangelical Christian groups for HIV/AIDS advocacy played a significant role, for example, in shaping and promoting U.S. President George W. Bush’s global HIV/AIDS initiative, The President’s Emergency Plan for AIDS Relief (PEPFAR). Even groups like Invisible Children, responsible for the viral Kony2012 video, are not outwardly evangelical, but are nonetheless headed by individuals whose religion plays a prominent role in the way they view their purpose in the world. While it is tempting, especially for dispassionate analysts and policymakers, to take the separation of church and state at face value, it is necessary to more closely interrogate the ways in which faith shapes not only individual actions, but political systems. How does religion affect our political, social, and even philanthropic lives? In an environment where voters have precious little information about their elected officials, apparent adherence to religious beliefs and practices can give some indication of the quality of a candidate. In an era of rampant corruption, a candidate who is perceived as religious may be more trustworthy than his or her atheist or less devout counterpart. U.S. presidential candidates, for example, must repeatedly discuss and proclaim their faith. Stories of redemption and renewal, often brought about by religious transformation, also win votes. A story of salvation from alcoholism and other exploits painted an inspiring image of former President Bush that many Americans admired, and one where faith featured front and center. Indeed, many voters use faith as a prerequisite for their support of a political candidate. 35% of Americans and 45% of Rwandans surveyed by the World Values Survey believe that “politicians who don’t believe in God are unfit for office.” Moreover, 62% of Rwandans and 42% of Americans agreed that it would be better if more people with strong religious beliefs held public office. As a politician in either of these countries, it only makes sense to announce your faith publicly. At the same time, going into too much detail about your faith can be almost as career-killing as not mentioning it at all. It is one thing to be Christian, but quite another to be Mormon, much less Muslim. Most Americans and Rwandans are Christian, either Protestant or Catholic. About half of all Americans are Protestant, while a quarter are Roman Catholics, and less than 1% are Muslim. 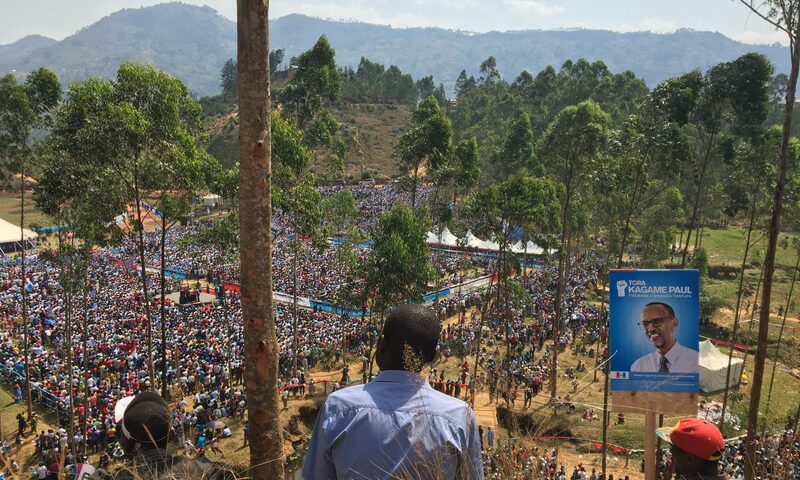 In Rwanda, the numbers are flipped – nearly 60% of Rwandans are Roman Catholic and 26% are Protestant. Another 11% are Adventist, and 5% are Muslim. Politicians who do not come from the predominant Christian denominations are hard-pressed to demonstrate that their beliefs are not far removed from “mainstream”. U.S. Republican candidate Mitt Romney, for example, has been at pains to assure voters that as a Mormon, his beliefs to not differ greatly from those of more mainstream Christianity. But if Romney thinks he has a hard time, his experience would surely pale in comparison to a Muslim candidate. I would wager the U.S. is about as far from electing a Muslim president as any country on earth. Perhaps it is not surprising that faith plays an important role in shaping people’s political preferences, even in a secular state. Nevertheless, the process by which faith seeps and soaks into politics and policy is not straightforward. Anecdotal evidence suggests that churches and religious leaders are a powerful force driving the political behavior of their followers. After all, from their pulpits, religious leaders have a great and even unique opportunity to shape public opinion. At the same time, however, most people do not react favorably to the explicit interference of the church in political behavior. About 60% of both Americans and Rwandans believe that religious leaders should not influence how people vote, and nearly 70% of Rwandans do not think religious leaders should influence government. Thus, there is an ideological tug-of-war underway. On the one hand, citizens living in secular countries subscribe to values of religious tolerance and even the religious agnosticism of the state. On the other hand, they often favor politicians who declare their faith, and punish those whose faith is not in the mainstream. To understand how faith intersects with politics, these two conflicting preferences must be reconciled. The question remains, to what extent do we have faith in politics?